Houbolt said it “turned into a 2.5 year fight to convince people, because they wouldn’t even listen to it,” Houbolt said. “Why was there so much resistance to it? That’s a good question, and the only thing I can come up with is the syndrome of N.I.H. — not invented here.” Indeed, Houbolt didn’t invent LOR: it was first proposed by Ukranian engineer Yurk Kondratyuk — in 1916. But with Houbolt’s insistence, LOR got a second look, and was adopted as the flight method to get the job done. LOR used one spacecraft to get the astronauts to lunar orbit (and back to Earth), and another to go from lunar orbit to the moon’s surface and back, and required a rendezvous — a re-linking of the two spacecraft — in lunar orbit. 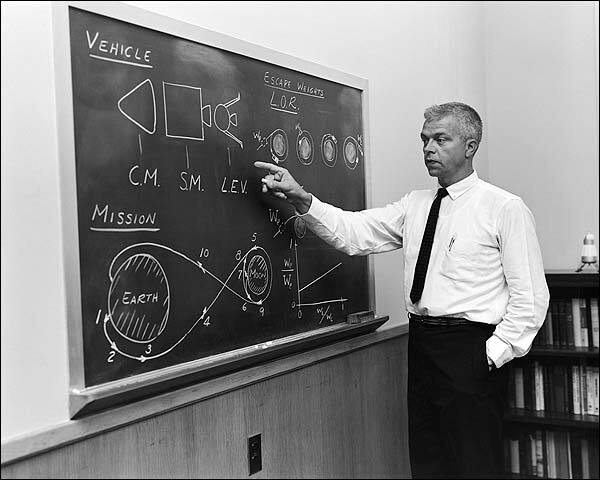 “Had the Lunar Orbit Rendezvous Mode not been chosen, Apollo would not have succeeded,” said George Low in 1982; Low was the NASA Administrator at the time of the moon landings. Even von Braun came around. When Apollo 11’s Eagle lunar lander settled into the moon, von Braun turned around and looked at Houbolt, and “did the OK sign and said, ‘Thank you, John,’” Houbolt remembered. “That was one of the biggest rewards I’ve ever had.” Houbolt was also recognized with the NASA Exceptional Scientific Achievement Medal. He retired from the agency in 1985, and died from Parkinson’s disease on April 15, five days after his 95th birthday.